Aggression: The number one reason why animals are given up to the shelter or euthanized. Aggression can be a very scary thing to see, but knowing the reason behind the aggression can give you a better understanding of why your pet acts the way it does and in most cases with time and consistency, the behavior can be modified. There are several different types of aggression and we’ll focus on the number 1 type in this blog: Social/dominance aggression. Dominance aggression is when there is social hierarchy. It is displayed when the social structure is challenged. This is usually displayed in a group of dogs and the Alpha dog (the “top dog”) is challenged by a dog lower in the hierarchy. This can happen over food, a comfortable place to rest, or a mate. This type of aggression needs to happen to avoid fights in the future. The challenges will happen for a couple of days until the hierarchy is established. But please, don’t let it get too far out of control. 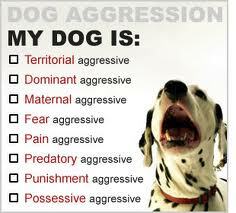 Challenges are more of a “show of aggression” such as growling or snarling and possibly a nip. Try to snap the dogs out of it if it starts to get too serious. However, it is important to remember NEVER to get between two dogs that are fighting. Your safety comes first! Once the hierarchy is established, it usually only takes a direct stare or threat of charging from the “Alpha” to diffuse any possible future confrontation. This type of aggression can also occur due to “scarce resources”, such as food, treats, the desired place to rest, and even your attention. The fix: when bringing in a new puppy or new adult dog, have the new dog take a submissive position to the existing dog(s). If you know that you have an existing dog that is a dominant dog, it would be helpful if the first meeting was made in neutral territory- such as a park. Make the new dog lie on its back and allow the other dog to sniff it. If needed, use a leash on the existing dog to keep contact minimal. Once contact has been made, and no aggression occurs, rewarding each dog with praise helps avoid future rumbles. Treats are effective as well, but make sure the existing dog gets the treat first. You don’t want to start a fight over treats! In most aggressive dogs, a good start is to 1.) make sure the dog is getting plenty of exercise to spend any pent-up energy. 2.) solidify basic obedience with the dog. Making the dominant/aggressive dog perform a submissive behavior (such as “sit”, “down”, “stay”) before whatever the trigger for the aggression happens, takes them out of that aggressive mind set. Social aggression in cats is most often seen in confined cats, since most feral cats are more solitary. Have you ever seen two cats walk past each other and then all of a sudden one pounces? They lay on their sides, belly-to-belly, clawing and biting until one jumps up and runs off. These cats are deciding who is going to be dominant. Much like dogs, confined cats will form a social hierarchy. Unlike dogs, however, the aggression may continue even after the hierarchy if formed. In the rare case that a feral group forms a hierarchy, it usually depends on size in females and age in males.